Panasonic aspires to provide a "safe and comfortable living environment for all." This includes homes, public spaces, office and mobility environments such as trains and automobiles. In order to realize this, it is important to improve air quality and to clean wet areas. To contribute clean air, Panasonic provides proprietary nanoe(TM) technology, which creates nano-sized electrostatic atomized water particles. Then, what can make wet areas clean? The "OZONE WATER" device we introduce, is the answer. This device can efficiently generate ozone water at home, for inhibiting bacteria and mold, and deodrization. The "OZONE WATER" device will become indispensable, because it will help keep wet areas such as toilets, bathrooms, and kitchens squeaky clean. Here are some key features of the "OZONE WATER" device. - What are ozone and ozone water? - What "OZONE WATER" can do? 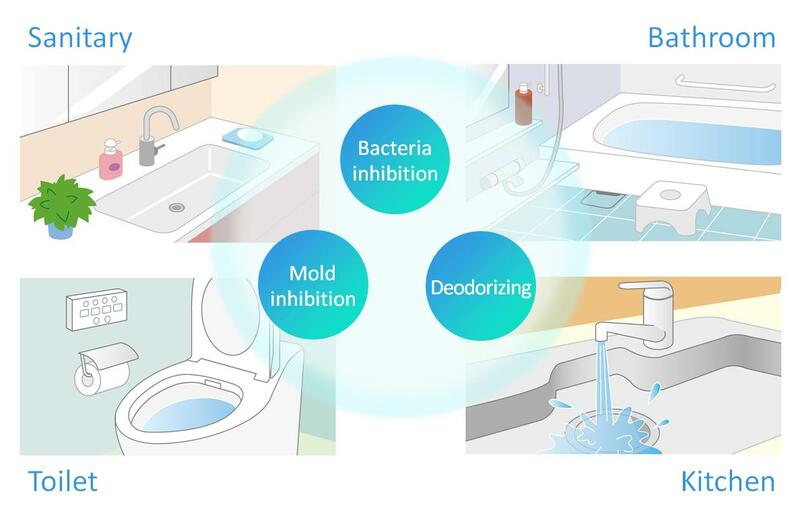 - Bacteria inhibitory effect of "OZONE WATER"
Ozone has powerful oxidizing action, so it can inhibit bacteria and mold, and deodorize. 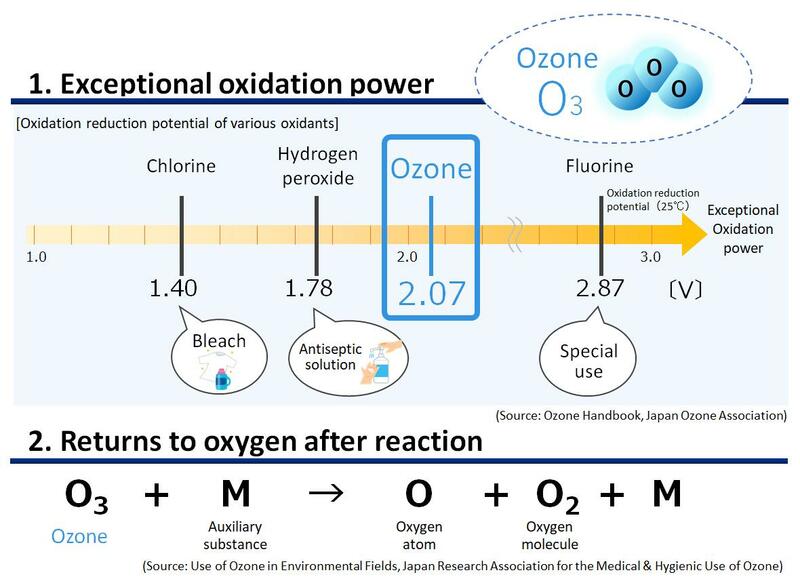 If you look at the redox potential chart as shown below, ozone ranks second after fluorine among various oxidizing agents. So ozone has a strong oxidation capability. 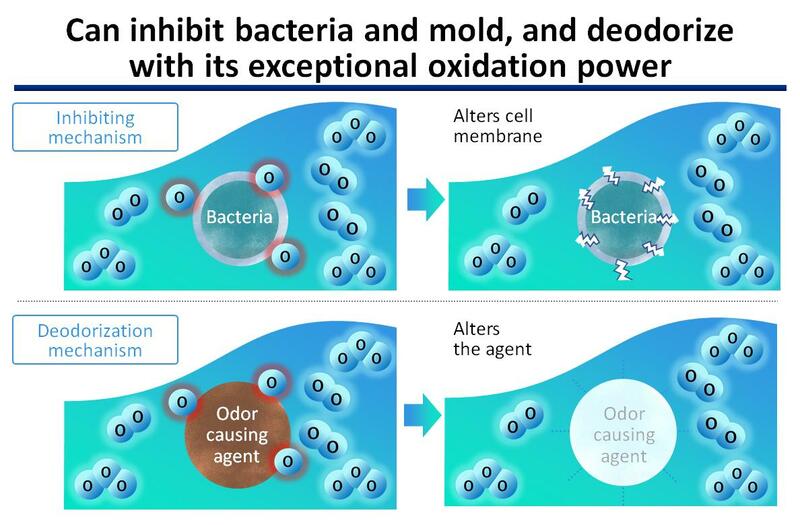 After ozone reacts with bacteria or odor causing agents, it changes into oxygen. In other words, ozone has no residuals. Ozone water is ozone-dissolved water. Compared with air at the same concentration, water can hold more ozone molecules, and thus is more effective. And it is easy to handle and can react to the target effectively, because it's liquid. The mechanism how the ozone water inhibits bacteria is when bacteria come in contact with the ozone molecules in the water, one oxygen atom separates from each ozone molecule and it attacks on the bacteria's cellular membrane. The cellular membrane of the bacteria is damaged and destroyed by the oxygen, then the bacteria become inactive and be inhibited. Ozone treats over the odor agents and deodorize them. Actually, ozone water is already created and used in many facilities which require high level sanitation, such as water purification plants, sewage plants, and semiconductor factories. Recently ozone water is also used at food factories to wash sliced vegetable, because it doesn't require any chemicals. Panasonic started to develop the useful ozone water generating technology for home-use, not for large-scale factories. 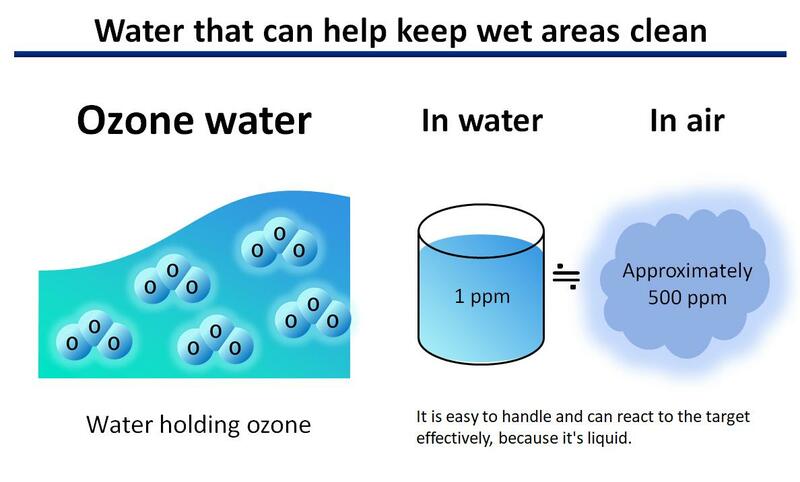 There are 2 ways to generate ozone water. First is the "gas dissolution" method, which is mainly used at water purification plants. It generates ozone gas in the air with high-voltage discharge, mixes and dissolves it into the water. This method generates a lot of undissolved gas, and it is difficult to make the device compact, because it needs many subsystems such as injectors or air-pumps for dissolving gas. Second is the "electrolysis" method, which generates ozone water directly from water with special electrodes. This method has high dissolution efficiency compared to "gas-dissolving" method, and creates ozone water quickly when the voltage is applied. Panasonic has selected this method since it has a simple configuration, and is suitable for small appliances. 1. Simple structure that generates "OZONE WATER" only with water and electricity. 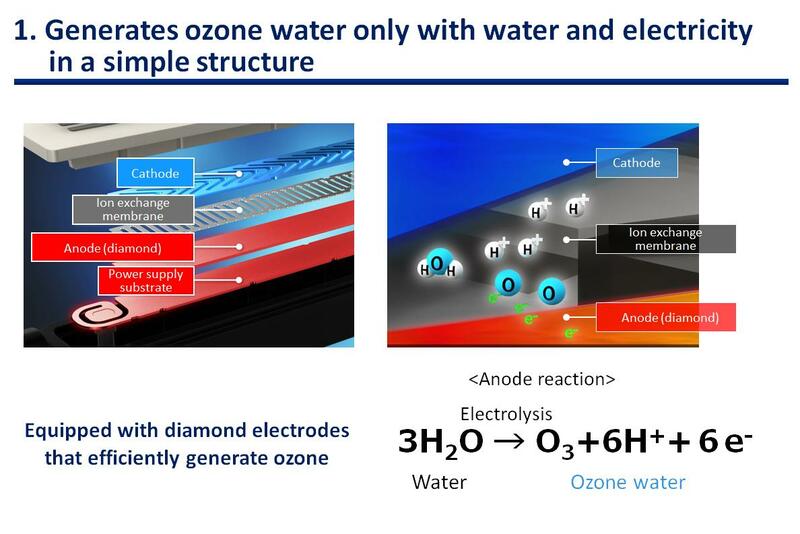 The "OZONE WATER" device has the simple layer structure, with a diamond electrode which generates ozone efficiently. When the water is electrolyzed in the device, a reaction described below occurs, and the water turns into "OZONE WATER". The left side of the diagram below is the general electrolysis method to generate ozone water. Undissolved ozone-gas appears as air bubbles. 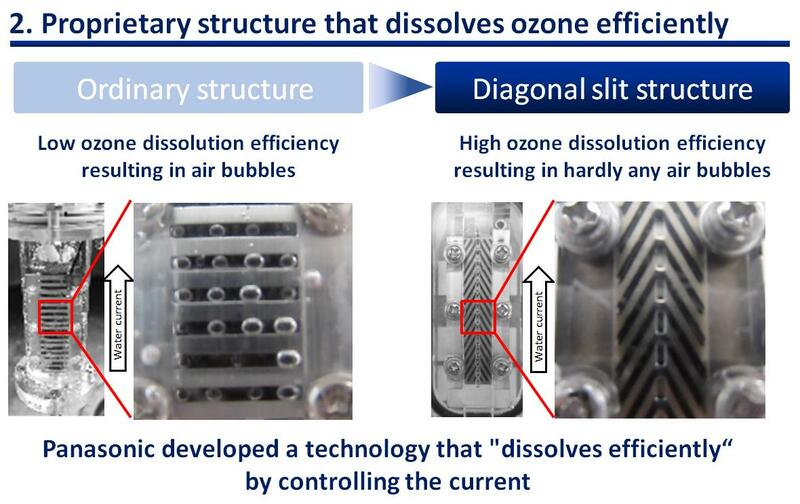 But on the other hand, hardly any air bubbles are visible with the device Panasonic has developed, because the unique "diagonal-slit" electrode shape enables ozone to dissolve into the water efficiently. This structure realized high-efficient ozone dissolving. 3. Palm sized and easy to build in products for wet areas. 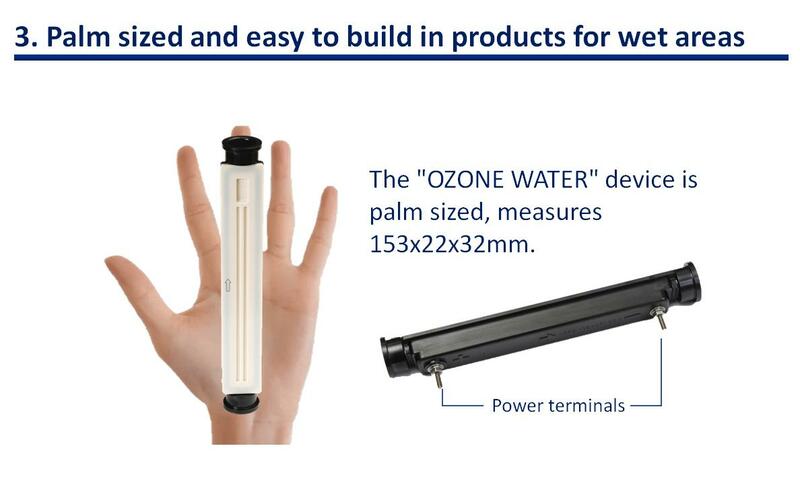 The "OZONE WATER" device is palm sized, measures 153x22x32mm. And it is a simple device that only requires you to connect the water inlet/outlet and the power terminals. So it will be easily applied to various devices in the wet areas in your home and elsewhere. This video demonstrates how ozone water is made from tap water using the "OZONE WATER" device. In this video, the colored test reagent becomes colorless as soon as the"OZONE WATER" is added. 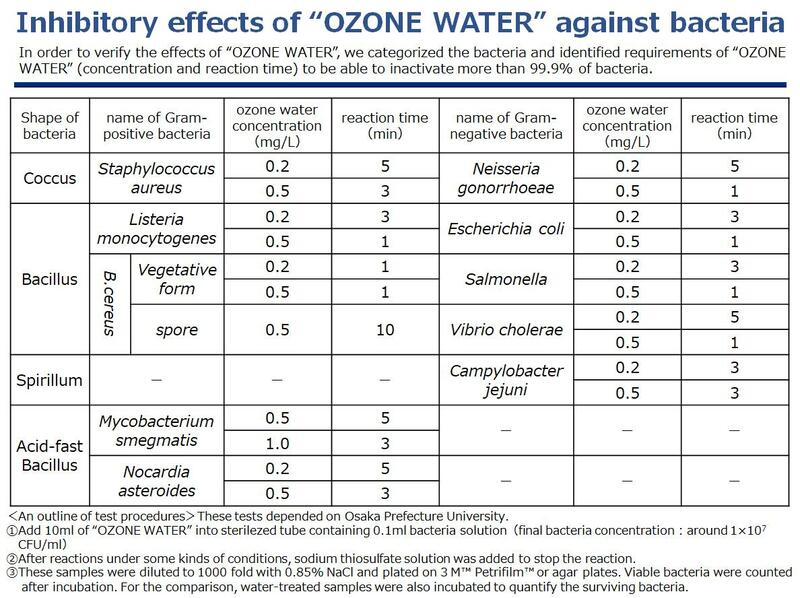 This visually shows how the "OZONE WATER" generated by the "OZONE WATER" device inhibits bacteria. 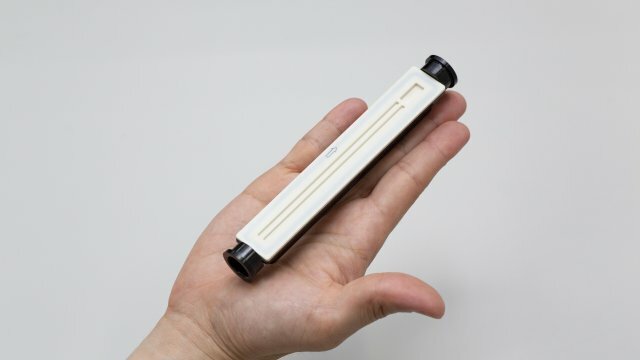 Bacteria inhibitory effect of "OZONE WATER"
Tests have proven that the ozone water generated by this device will inhibit over 99.9% of bacteria and fungi. Effects of "OZONE WATER" to inhibit bacteria. *These are not the results from actual usage environments. 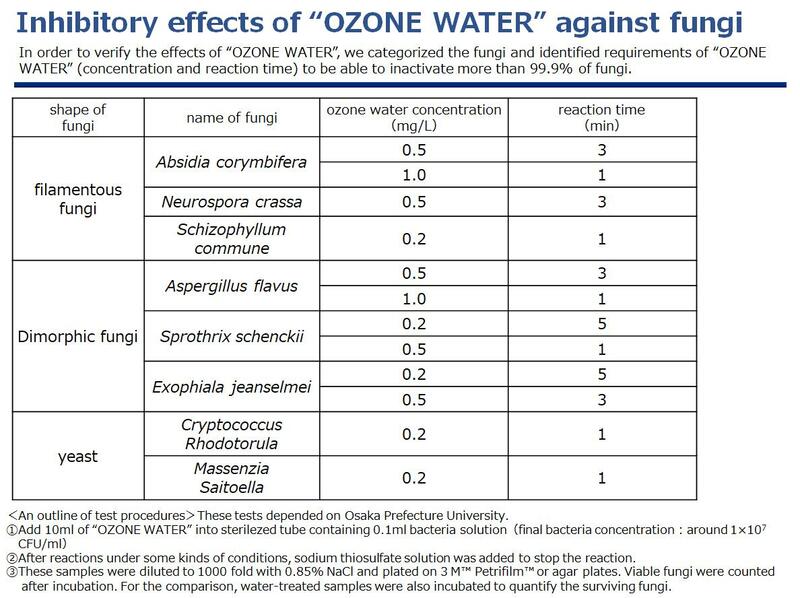 Effects of "OZONE WATER" to inhibit fungi. *These are not the results from actual usage environments. 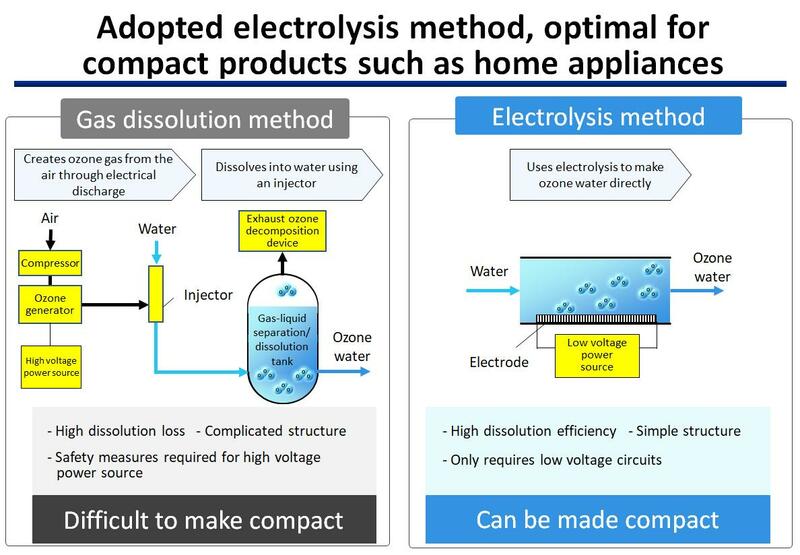 How to use the "OZONE WATER"
According to Tomohiro Yamaguchi and Kenichirou Inagaki, from Panasonic Corp. Appliances Company, who developed this product, "Panasonic has been developing many water appliances for a very long time, such as water purifiers, kitchen, bathroom, toilet or so. This 'OZONE WATER' device also required a lot of trial and error to develop, and we finally arrived at this shape and size. Fortunately we were able to complete this project, thanks for the wisdom of members familiar with various water appliance products. " 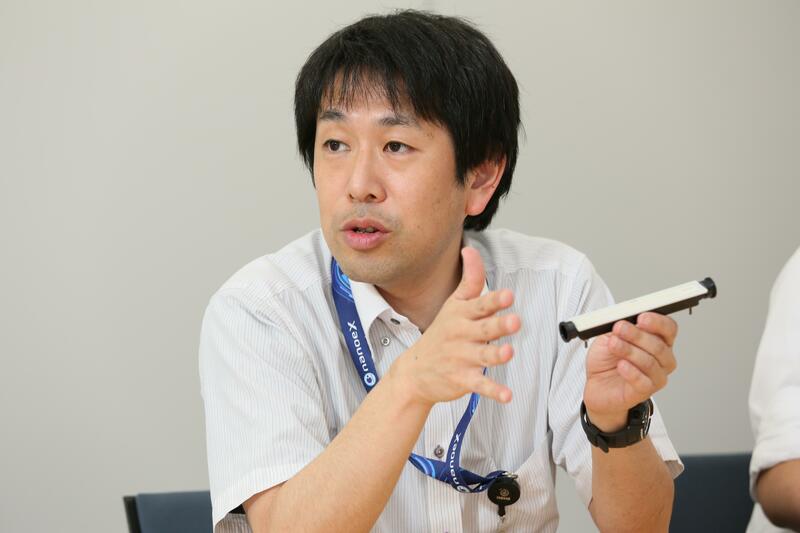 Panasonic Corporation, Appliances Company, Beauty and Living Buisiness Division, Manager, Tomohiro Yamaguchi. 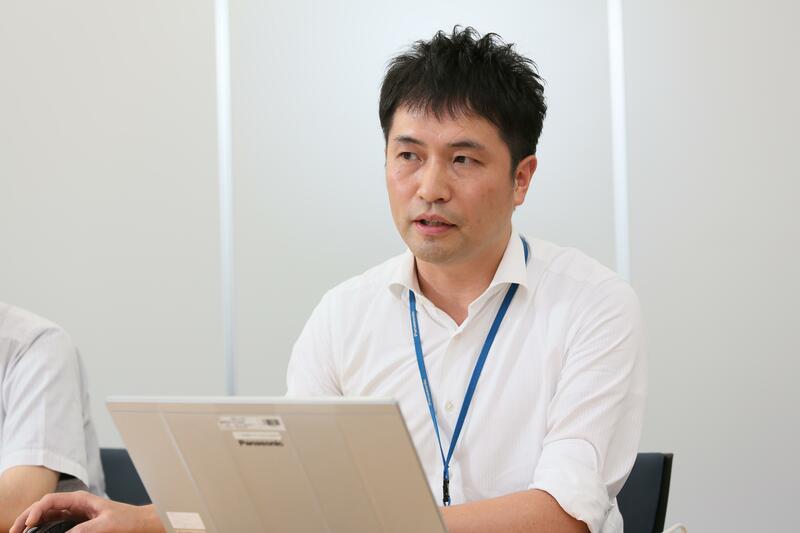 Panasonic Corporation, Appliances Company, Corporate Engineering Division, Home Appliances Development Center, Staff Engineer, Kenichirou Inagaki. The "OZONE WATER" device will keep toilets, bathrooms and kitchens clean to save you the trouble, and realize a hygienic and safe living environment. Please look forward to more from Panasonic's "OZONE WATER" device and the ozone water it creates.